There are currently 95,153 users on this website. Byzantine Anon Follis Time Of Basil II & Const. VIIi 19.2 Grams And ? Hello and we hope everyone is feeling well this nice day! 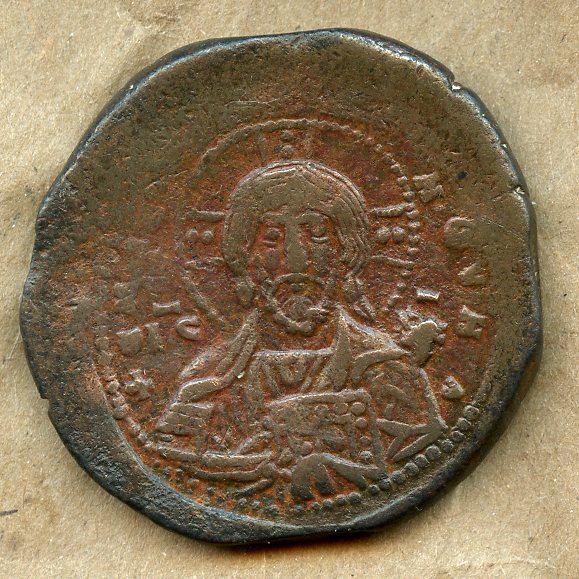 We have this Byzantine Follis, Sear #1813 as seen: it weighs a whopping 19.2 grams. It has casting marks on four sides, aligned for striking NSEW (a bit about the casting: all the sprues were cast to be inside the coin-only one was filed away). The coiner had to know that the flan was heavy by over 25%! Closer examination reveals that red ochre was applied to the obverse and reverse struck areas. There appear to be no circulation marks that one would expect of a heavy, large copper coin of the period. Is this too much of an oddball to be a 'normal' Follis? It was a part of a 19th century collection of ancients we have recently purchased. @wdwhh, could you please add a couple pics of the flat spots on the edge? It is more for my own education as I was thinking that this coins should be struck rather than cast (I'm not an expert in these coins). By the way, my copy of Sear's Byzantine Coins & Their Values lists a different coin for #1813 (an AE17 of Basil II). I must be using a different reference book than you are. @echizento is (one of) the Byzantine specialist(s). I'm sure that he will weigh in when he sees this thread. 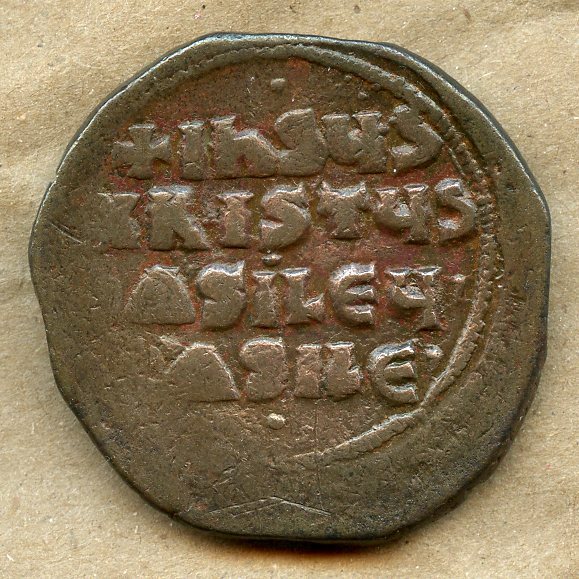 "Basil II and Constantine VIII, AE Class 2 anonymous follis. 976-1028 AD. IC-XC to left and right of bust of Christ, facing, with nimbate cross behind head, holding book of gospels, sometimes with dots in centre of book's border, two dots in each limb of the cross / IhSUS XRISTUS bASILEU bASILE in four lines, ornament below. SB 1813.."
It is Sear 1813 or more like a variant of. There are coins that have been found over 20 grams, size should be right around 36mm. IMO the obverse has been tooled slightly to enhance the detail. The alignment of the four casting marks to NSEW is purposeful; we're wondering if the coiner was making a talisman. We've had a few of this type; none were struck on a cast planchet. Looking at the Dumbarton Oaks catalogue, I count 66 distinct varieties of this type, the op coin is most similar to variety 24b: pair of pellets in each arm of the nimbus cross; book with jeweled border and jeweled X across cover; single pellets above and below reverse. Looks like the op coin may have an additional ornament at reverse center. The one example of the 24b variety in the collection (A2.24b) weighs 16.90gm and is 32mm in diameter. Most ancient flans are cast. Some retain signs of casting after being struck. Others do not. The "red ochre" looks like normal red sand patina. Sometimes it's original. Sometimes it's added to increase contrast. Nice coin. We have discovered cast planchets that were used at Machin's Mills; we just fount it weird and not fiscally responsible for a planchet to be cast from 4 different directions. That is not normal.